Angelo Mangiarotti ( 1921-2012) A wonderful alabaster table lamp, with a decorative rhythmic pattern of perforations throughout the dome which create a soft and tempered light. Italy, circa 1980. Dimensions: 16 diameter x 9 height. Angelo Mangiarotti Chierico table lamp. Murano glass dome shaped interior light source, with glass shade sits on glass dome. Ghost lamp by Angelo Mangiarotti, Polluce collection for Skipper, Italy, Mazzega Murano, circa 1970. 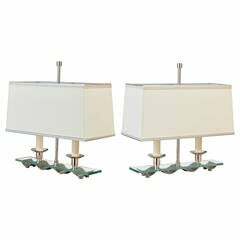 Italian Alabaster lamps circa 1970 in the style of Angelo Mangiarotti Excellent conditions. Chromed-steel and glass table lamp designed by Angelo Mangiarotti in circa 1970. Through a touch-sensitive switch this light turns on, off and dims. Beautiful table lamp Sfera in Murano glass and chromed metal designed by Angelo Mangiarotti and produced by Skipper in circa 1970. Table lamp by Angelo Mangiarotti, Polluce collection for Skipper, Italy, Mazzega Murano, circa 1970.